When women in our culture show character, they are not considered desirable, as opposed to the generic, artless 'beauty’. My paintings reveal women’s bare humanity with all its flaws and imperfections, blown up to an unavoidable size. I pose the question: Why does society find the average woman’s body so confronting? 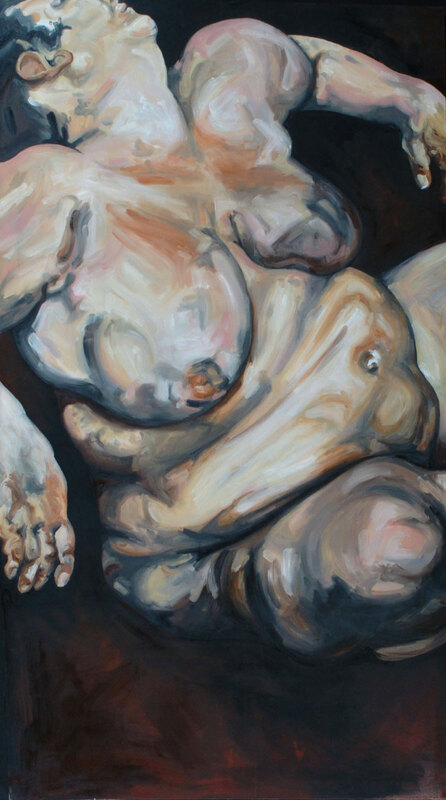 How have Adriana Picker and Lucian Freud critiqued notions of traditional beauty and the objectified woman through the depiction of 'real’ fleshy nudes? Compare the rich painterly colour in Picker’s work to the linear nature of Freud’s etching. How has each artist used their respective mediums to capture the contour and proportion of the female figure?